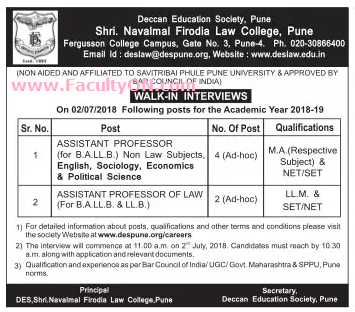 Shri.Navalmal Firodia Law College, Pune has advertised in the LOKSATTA newspaper for recruitment of Teaching Faculty- Assistant Professor jobs vacancies. Interested and eligible job aspirants are requested to walk-in on 02nd July 2018. Check out further more details below. About College: DES Shri. Navalmal Firodia Law College (DES SNFLC) has distinct advantage of having a unique heritage of Deccan Education Society, and we intend to fiercely guard and cherish it. We follow the same tradition of our parent society today, which is reflected in the tremendous growth of DES SNFLC in a short span of time. DES Shri. Navalmal Firodia Law College has entered in its 13th year, keeping pace with the social change and answering responsibly, all the demands of any complex and intricate global legal set up. We have brought about tremendous metamorphosis in terms of inculcating legal education through innovative pedagogy. How to Apply: Interested and eligible candidates are requested to attend the Walk-in interview. The interview will commence at 11:00 am on 2nd July, 2018. Candidates must reach by 10:30 am along with application and relevant documents. The walk-in venue is given below.